Savings due to Direct Benefit Transfer over the last three years have touched Rs.50,000 cr as on December 31, 2016. This amount is equivalent to the subsidy paid out under DBT in this financial year, implying nearly a year's subsidy was saved. Nearly 33 crore people receive various subsidies directly in their bank accounts now through DBT. 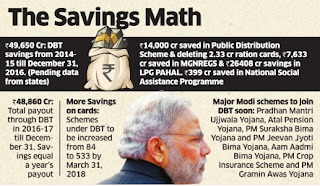 As per government's interim figures as on December 31, the cumulative DBT savings stand at Rs.49,650 cr, pending information from many states. The government says it has saved almost Rs.14,000 cr in its PDS by deleting 2.33 cr ration cards so far and better targeting of beneficiaries through DBT. Rs.7,633 cr is cited as the savings in the MGNREGS scheme by the government so far. Rs.399 cr is cited as savings in the National Social Assistance Programme. The biggest saving of Rs.26,408 cr is cited in the LPG PAHAL scheme, including Rs.4,824 Cr in the first nine months of this financial year. The LPG subsidy payout qualifies as the world's largest cash transfer programme. The government is sticking to its guns on the LPG subsidy savings figure despite the Comptroller and Auditor General of India poking holes in the same in a recent report saying the savings were “exaggerated“. C&AG said the government had assumed that the 3.11 cr blocked or inactive customers would have availed 12 subsidised cylinders apiece rather than only 6 cylinders as per national average per capita consumption of cylinders. The major schemes new on DBT platform over the next one year will include Pradhan Mantri Ujjwala Yojana, Atal Pension Yojana, PM Suraksha Bima Yojana and PM Jeevan Jyoti Bima Yojana, PM Crop Insurance Scheme and PM Gramin Awas Yojana.